The images below will guide you in the process of starting a new thread after you have joined. After logging in make sure you click on the “Forum” menu item as shown in 1. This will take you to the main Forum page to see all available areas of the Forum. 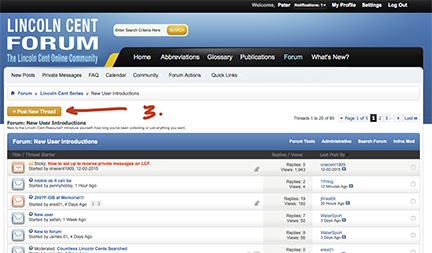 As a new member we encourage you to first start a new thread in the “New User Introduction” Forum as shown in 2. 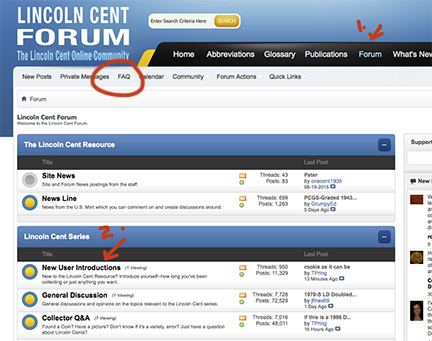 Most information for Forum usage and guidance can be found in the red circled “FAQ” area as shown in the image below. After you enter the “New User Introduction” Forum, or any other Forum you will see the “start A New Thread” orange button as shown in 3. Title your new thread, add content and then “Submit” the new thread when you are satisfied. You can review it and add images if needed. Please post only one question or coin that you want to share with the group in each thread you start. This way the maximum amount of members will know what you are posting from the title and be able to respond accordingly.